Encompassing nearly 55,000 square miles, the state of New York is only the 27th largest state in the United States geographically speaking. The state is the third-highest populated state only behind California and Texas. New York's major industries include "finance, communications, international trade, publishing, fashion, communications, farming (fruit and dairy), and tourism." While the state's capital city is Albany, it is New York City which is of course the largest and most influential city in the state, and arguably the world as well. Four United States Presidents have hailed from New York including Martin Van Buren, Millard Fillmore, Theodore Roosevelt, and Franklin Delano Roosevelt. Known as "The Empire State," New York was given its name by the British to honor the Duke of York in England in 1664. Some less-common facts about the state include it was the site for the first American chess tournament in 1843, the city of New York has over 700 miles of subway track, and "Sam Wilson, a meatpacker from Troy who's caricature Uncle Sam came to personify the United States is buried at Troy's Oakwood Cemetery. During the War of 1812, he stamped âU.S. Beef' on his products which soldiers interpreted the U.S. abbreviation as meaning Uncle Sam." With a ranking as #11 in U.S. News & World Report's Best States for Educational Attainment, the state of New York delivers a host of the nation's best online Master's of Business Administration programs. While many agree that the MBA has become the gold standard for business and management education, the online Master's of Business Administration is a perfect choice for today's business professionals looking for a well-rounded degree. While these programs may vary in factors like length and tuition fees, most business schools feature most of the same admissions requirements of candidates. Many business schools require students to have attained two or more years of professional experience and an undergraduate degree awarded by an accredited college or university as prerequisites for admission. While GMAT scores are often required during the application process, some schools will waive all GMAT or GRE requirements leaning more heavily on the criteria of letters of recommendation, essays, and candidate interviews. Understanding there are a myriad of factors to consider while researching online MBA programs, we have compiled a ranking of the top online MBA programs in New York. While these programs are offered within a spectrum of total tuition cost ranging between being classified as average to expensive, each one of these programs is backed by their business school's being accredited by such reputable organizations as the Association to Advance Collegiate Schools of Business, the Accreditation Council for Business Schools and Programs, or the International Assembly for Collegiate Business Education. We hope this ranking of New York's best online MBAs will help you in your quest of finding an online degree that is right for you. Note: A detailed explanation of the methodology we used to determine the best online MBA programs in New York can be found at the end of the ranking. Syracuse University delivers New York's top online Master's of Business Administration at the Martin J. Whitman School of Management. This best-of-the-best 54-credit hour program is a must for the business student seeking a high-quality distance education. Photo creditThe Martin J. Whitman School of Management at Syracuse University features New York's best online Master's of Business Administration with concentrations in Accounting, Business Analytics, Entrepreneurship, Finance, Marketing Management, and Supply Chain Management. This 54-credit hour program is classified as expensive with a total tuition price between $50,000 and $99,999. U.S. News and World Report Best Business Schools Ranking reveals that some graduates from the Martin J. Whitman School of Management report an average base salary of $67,589 after graduation, showing a healthy potential for the return of investment in education. Learning outcomes from this program include a student's being able to "understand how to effectively manage organizational resources, communicate effectively and persuasively, demonstrate skills in inquiry, critical thinking, and problem solving, and think strategically about business issues." While U.S. News & World Report has recently recognized the business school as offering the 42nd best online MBA in the nation, the Princeton Review has also recognized it as offering the 23rd best in the nation, while Financial Times has ranked it as 10th. Quacquarelli Symonds has recognized this online MBA as the 28th best on the planet. The business school receives its stellar business accreditation through the Association to Advance Collegiate Schools of Business. Home of the Orange who wear the school color of Orange, the athletic department at Syracuse University supports men's and women's varsity sports teams which compete at the NCAA Division I level as powerhouse members of the Atlantic Coast Conference. The university is a four-year, private not-for-profit institution of higher learning with a main campus located in Syracuse, New York. The university delivers degrees at the associate, undergraduate, graduate, and doctoral levels to the 21,970 students currently enrolled there. âCuse was founded in 1870 when the state of New York granted its charter and the city of Syracuse provided $100,000 for its establishment. From the beginning, Syracuse was a coeducational institution with men and women learning alongside each other in the classroom. From early on, Syracuse encouraged women-only clubs and organizations on campus. The university receives its regional accreditation through the Middle States Commission on Higher Education and features Suos Cultores Scientia Coronat "Knowledge crowns those who seek her" as its official school motto. One of New York's best online Master's of Business Administration programs is offered by the School of Business at SUNY Oswego. This prestigious program shines with excellent accreditation and recognition from U.S. News & World Report as one of the best in the nation. Photo creditSUNY Oswego offers an online Master's of Business Administration with specializations in Health Services Administration and Public Accounting, with a Nursing Home Administration advanced certificate, or delivered as a general MBA at the School of Business. Qualifying students with the proper academic background may waive up to 21 credit hours of foundational coursework saving time and tuition fees. This 36-credit hour program is classified as average in affordability with a total tuition price between $20,000 and $29,999. A great potential for a healthy return on the investment of education is apparent from U.S. News and World Report's Best Business Schools Ranking, which shows that some graduates from the School of Business report an average base salary of $49,900 after graduation. The School of Business receives its excellent business accreditation through the Association to Advance Collegiate Schools of Business. The AACSB is the gold standard for accrediting bodies in higher education. Admission requirements for this program include the completion of an undergraduate degree from an accredited college or university along with a minimum GPA of 2.6, a GMAT score of at least 500, and two letters of reference. U.S. News & World Report has recently recognized the business school as offering the 33rd best online MBA in the nation. Established in 1861, State University of New York at Oswego is a four-year, public institution of higher learning with a main campus located in Oswego, New York. Operating under the school motto of "To Learn, To Search, To Serve," the university was founded by Edward Austin Sheldon as the Oswego Primary Teachers Training School. Sheldon introduced the revolutionary teaching approach, the Oswego Movement, to America. One hundred years after its being established, the school became a liberal arts college. Receiving its regional accreditation through the Middle States Commission on Higher Education, the university delivers degrees at the undergraduate and graduate levels to the student body of 8,004 currently enrolled. Home of the Lakers, the athletic department at SUNY Oswego supports 24 men's and women's varsity sports teams which compete at the NCAA Division III level as members of the State University of New York Athletic Conference. The school's official colors are hunter green and golden yellow. The David D. Reh School of Business at Clarkson University features an online Master's of Business Administration. This nationally-recognized, top-three program consists of 16 excellent business leadership courses. Photo courtesy of Clarkson UniversityOne of New York's best online Master's of Business Administration degrees with additional Advanced Certificates in Global Supply Chain Management, Business Fundamentals, Human Resource Management, Healthcare Management, and Management and Leadership is offered at the David D. Reh School of Business at Clarkson University. Some of these certificates are offered as 100% online programs and some as hybrids. This 48-credit hour, 16-course program is classified as expensive in affordability with a total tuition price between $50,000 and $99,999. A great potential for a healthy return on the investment of education is apparent from U.S. News and World Report's Best Business Schools Ranking that reports some graduates from the David D. Reh School of Business earn an average base salary of $61,311 after graduation. The business school receives its excellent business accreditation through the Association to Advance Collegiate Schools of Business. Courses within this program include Leadership and Organizational Behavior, Financial and managerial Accounting for Decision Making, Decision Analysis and Supply Chain Modeling, Financial Management, Marketing Management, Business Information Systems, Corporate Ethical and Social Responsibility, and Statistical Methods for Data Analytics. Clarkson University was originally founded as the Thomas S. Clarkson Memorial School of Technology in 1896. The school's namesake was local entrepreneur, Thomas Clarkson who died of complications after bravely saving the life of a quarry worker. The school achieved its university status in 1984 and in 2016 absorbed Union Graduate College. Receiving its regional accreditation through the Middle States Commission on Higher Education, the university exists today as a four-year, private not-for-profit institution of higher learning with a main campus in Potsdam, New York. Delivering degrees at the undergraduate, graduate, and doctoral levels, Clarkson oversees a student body of 4,384. Home of the Golden Knights, the official school colors of the university are green and gold. The athletic department at Clarkson consists of 20 men's and women's varsity sports teams which compete at the NCAA Division III level as members of the Liberty League. Rochester Institute of Technology features an online Executive Master's of Business Administration at the Saunders College of Business. This 17-month program is one the discerning distance learner should take note of as it features a robust curriculum and is backed by a stellar business accreditation through the AACSB. Photo creditThe Saunders College of Business at the Rochester Institute of Technology features one of New York's best online Executive Master's of Business Administration degrees. This 17-month, four-semester program is classified as expensive in affordability with a total tuition price between $50,000 and $99,999. According to the U.S. News and World Report Best Business Schools Ranking, graduates from the Saunders College of Business report an average base salary of $56,747 after graduation, which shows great potential for a healthy return on the investment of education. The business school receives its stellar business accreditation through the Association to Advance Collegiate Schools of Business. This program has been designed for "mid-to-upper level professionals wishing to hone their business and leadership skills in order to enhance their performance, assume greater responsibilities, and effectively position themselves for future opportunities." The program features two start times each year and is a cohort-based program. Courses within this program include Team Building Ethics, Accounting and Organizational Goals, Statistical Analysis for managers, Leadership Development Skills, Managerial Accounting, Valuation and capital Budgeting, Microeconomics, Managing Technology, Innovation & Research, Systems Support of Operations, Executive Leadership, and Managing New Product Commercialization. Recognitions for this program include U.S. News & World Report recently recognizing the business school as offering the 36th best online MBA in the nation and the Princeton Review awarding it with the 8th top spot in the country. Home of the Tigers who wear the school colors of brown and orange, the athletic department at Rochester Institute of Technology supports 24 men's and women's varsity sports teams which compete at the NCAA Division III level as members of the Liberty League. RIT is a four-year, private not-for-profit institution of higher learning with a main campus located in Rochester, New York. The university delivers degrees at the associate, undergraduate, graduate, and doctoral levels to the 16,507 students currently enrolled there. Rochester Institute of Technology was established in 1825 as Rochester Athenaeum and Mechanics Institute. The school receives its regional accreditation through the Middle States Commission on Higher Education and features "The making of a living and the living of a life" as its official school motto. An online MBA is delivered by Marist College's School of Management. This top-five program offers a high-quality 100% online degree that has been designed to equip future business leaders. Photo creditMarist College's School of Management features one of New York's best online Master's of Business Administration degrees with a concentration in Ethical Leadership, Financial Management, and Healthcare Administration. U.S. News & World Report has recently recognized the business school as offering the 76th best online MBA in the nation. This online MBA has also been selected as the 37th best on the planet by Quacquarelli Symonds. This 36-credit hour degree is classified as average in affordability with a total tuition price between $20,000 and $39,999. The School of Management receives its excellent business accreditation through the Association to Advance Collegiate Schools of Business. Admission requirements for the degree include a completed Graduate Admission Application, a $50 application fee, responses to essay questions, a current resume, official transcripts of all previous undergraduate and graduate coursework, and GMAT/GRE scores. Applicants already holding a graduate degree or higher are exempt from the GMAT requirement. Core courses within this program include The 21st Century Manager, Global Environment of Business, Economics, Analytics Bootcamp, Accounting, Marketing Management, Finance, Operations Management, and Strategic Management. Established in 1929 as Marist Normal Training School, today's Marist College is a four-year, private not-for-profit institution of higher learning with a main campus located in Poughkeepsie, New York. Operating under the school motto of Orare et Laborare "To Pray and To Work," the school began granting four-year degrees in 1946 and by 1960 lay male students were admitted into the school. Receiving its regional accreditation through the Middle States Commission on Higher Education, the college delivers degrees at the undergraduate and graduate levels to the student body of 6,569 currently enrolled there. Home of the Red Foxes, the athletic department at Marist supports men's and women's varsity sports teams which compete at the NCAA Division I level as members of the Metro Atlantic Athletic Conference. The school's official colors are red and white. St. Bonaventure University delivers an online Master's of Business Administration at the School of Business. This highly-accredited 36-credit hour degree is a must for the business student seeking a nationally-ranked program. Photo creditThe School of Business at St. Bonaventure University delivers one of New York's best online Master's of Business Administration degrees with concentrations in Accounting, Finance, and Marketing, and also offered as a general business MBA. This 33-credit hour program is classified as average in affordability with a total tuition price between $20,000 and $29,999. The business school receives its stellar business accreditation through the Association to Advance Collegiate Schools of Business. U.S. News & World Report has recently recognized the business school as offering the 205th best online MBA in the nation. Admission requirements include the submission of a GMAT/GRE score, current resume, official transcripts from all previously attended institutions of higher learning and an undergraduate degree from an accredited college or university. Applicants possessing an overall undergraduate GPA of 3.30 or better, a GPA of 3.0 to 3.29 with two or more years of professional experience, or another satisfactory graduate aptitude test score may be able to waive the GMAT requirement in the application process. This degree is divided between foundation courses, business core courses, breadth courses, graduate electives, and business policy courses. Business core courses include Financial Management, Marketing Management, Organizational Behavior, and Accounting Practices and Analysis. Home of the Bonnies who wear the school colors of brown and white, the athletic department at St. Bonaventure University supports seven men's and seven women's varsity sports teams which compete at the NCAA Division I level as members of the Atlantic 10 Conference. St. Bonaventure is a four-year, private not-for-profit institution of higher learning with a main campus located in Saint Bonaventure, New York. The university delivers degrees at the undergraduate and graduate levels to the 2,040 students currently enrolled there. The university was founded in 1858 as St. Bonaventure's College by Nicolas Devereux, an area financier. The school achieved its university status in 1950. St. Bonaventure University receives its regional accreditation through the Middle States Commission on Higher Education and features "Becoming Extraordinary" as its official school motto. One of New York's best online Master's of Business Administration degrees is offered by the School of Business and Justice Studies at Utica College. This excellent distance degree shines with a business accreditation through the Accreditation Council for Business Schools and Programs. Photo creditUtica College offers an online Master's of Business Administration with specializations in Finance/Accounting, Insurance & Risk Management, Cybersecurity, Cyber Policy, Data Analytics, Entrepreneurship, Health Care Management, or delivered as a general MBA through the School of Business and Justice Studies. This 30-credit hour program is classified as average in affordability with a total tuition price between $20,000 and $29,999. The School of Business and Justice Studies receives its excellent business accreditation through the Accreditation Council for Business Schools and Programs. The ACBSP is the one of the nation's best accrediting bodies in higher education. This degree has been designed "to meet the needs and educational demands of today's students and transform them into tomorrow's business leaders. The program is built on three core tenants — format, specialization, and innovation of the business core. Each offers you a distinct advantage, as well as positions you for a successful, sustainable career in the global marketplace." This degree is divided between 10 core courses and 12 specialization credits. Courses within this program include Principles and Practices of Leadership I and II, Financial Fluency I and II, Data-driven Decision-making I and II, The Global Consumer, Markets and Logistics I and II, and Strategy I and II. U.S. News & World Report has recently recognized the business school as offering the 125th best online MBA in the nation. Established in 1946, Utica College is a four-year, private not-for-profit institution of higher learning with a main campus located in Utica, New York. 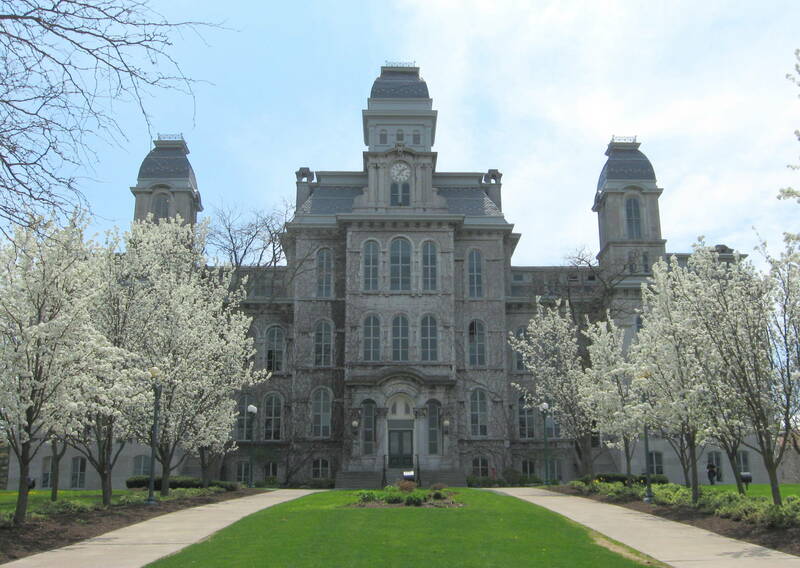 The university was originally founded as Utica College of Syracuse University. The school was granted its financial and legal independence from Syracuse in 1995. Receiving its regional accreditation through the Middle States Commission on Higher Education, the college delivers degrees at the undergraduate, graduate, and doctoral levels to the student body of 5,118 currently enrolled there. Utica College currently offers 40 undergraduate majors and 21 graduate programs. The athletic department at the school supports men's and women's varsity sports teams which compete at the NCAA Division III level as members of the Empire 8 Conference. The College of Business Management at SUNY Polytechnic Institute features an online Technology Management Master's of Business Administration. This 100% online program is backed by the business school's stellar business accreditation through the AACSB. Photo creditOne of New York's best online Master's of Business Administration degrees with concentrations in Accounting and Finance, Health Informatics, Human Resource Management, Marketing Management, and Business Management is delivered at the College of Business Management by SUNY Polytechnic Institute. This 48-credit hour program is classified as average in affordability with a total tuition price between $20,000 and $29,999. The business school has recently been recognized by U.S. News & World Report as offering the 125th best online MBA in the nation. The College of Business Management receives its excellent business accreditation through the College of Business Management. This program has been designed to "prepare students for upper-level management jobs by stressing the use of contemporary techniques to frame, analyze, and solve business challenges. The program's diverse coursework is grounded in evidence-based management, finance, accounting, and economic principles. It incorporates the use of quantitative and qualitative analyses, design-thinking approaches, and robust experiential learning techniques." Admission requirements for this degree include a completed online Application for Graduate Admission with corresponding $60 application fee, official transcripts from all colleges and universities attended, GMAT score, one academic or professional reference, and a resume. Qualifying students may waive the GMAT requirement by meeting certain criteria. SUNY Polytechnic Institute was established in 1966. Receiving its regional accreditation through the Middle States Commission on Higher Education, the university exists today as a four-year, public institution of higher learning with a main campus in Utica, New York. Delivering degrees at the undergraduate, graduate, and doctoral levels, SUNY Poly oversees a student body of 2,697. Home of the Wildcats who compete at the NCAA Division III level as members of the North Eastern Athletic Conference, the school's official colors are blue, white, and gold. D'Youville College's School of Arts, Sciences and Education features an online Master's of Business Administration. This 36-credit hour program is one the discerning distance learner should take note of as it features a solid curriculum taught by a seasoned staff of educators. Photo creditThe School of Arts, Sciences and Education at D'Youville College features one of New York's best online Master's of Business Administration programs. This 36-credit hour program is classified as average in affordability with a total tuition price between $20,000 and $29,999. The School of Arts, Sciences and Education receives its excellent business accreditation through the International Assembly for Collegiate Business Education. Admission requirements for this program include an undergraduate degree from an accredited college or university with a corresponding GPA of at least 3.0, more than two years' experience of full-time employment at a professional or corporate level, a personal statement of purpose explaining goals and objectives, two letters of recommendation from employers, supervisors, or professors. Courses within this program include Business Methods Statistics, Financial & Management Accounting, Human Resources Management, Theories of Economics, Organizational Leadership, Legal Environment in Business, Marketing Management, Corporate Finance, and Special Topics in Business Management. Home of the Spartans and featuring the school colors of red and white, D'Youville College is a four-year, private not-for-profit institution of higher learning with a main campus situated in Buffalo, New York. The university delivers degrees at the undergraduate, graduate, and doctoral levels to the 2,965 students currently enrolled there. The college was established in 1908 by the Grey Nuns and named in honor of Marie-Marguerite d'Youville. Sainted and canonized by Pope John-Paul II in 1990, d'Youville founded the Order of Sisters of Charity of Montreal. Operating under the motto of Religio et Scientia (Religion and Knowledge), the school receives its regional accreditation through the Middle States Commission on Higher Education. An online Executive MBA is delivered at Pace University's Lubin School of Business. This top-10 program offers the distance earner a high-quality education in business without sacrificing flexibility and convenience. Photo creditPace University's Lubin School of Business features one of New York's best online Executive Master's of Business Administration degrees. This Executive MBA has been designed for "students to complete eight courses consisting of individual learning exercises and team projects, plus a capstone course consisting of an individual project and a business simulation. Team projects require students to solve contemporary large-scale business problems utilizing a holistic, cross-disciplinary approach. Students also apply what they learn to specific consulting projects for actual companies." Courses within this 48-credit hour program include Business Analysis, Comprehensive Business Strategy, Corporative Diversification Strategy, Operations Management, Marketing, Corporate Finance, Public Policy, Organizational Behavior and Change, and Independent Project and Business Simulation. This program is classified as expensive with a total tuition price between $50,000 and $99,999. According to the US New and World Report's Best Business Schools Ranking, graduates from the business school report an average base salary of $62,340 after graduation, giving potential for a healthy return on investment of education. The Lubin School of Business receives its excellent business accreditation through the Association to Advance Collegiate Schools of Business. Candidates interested in this program are encouraged to contact the business school's admissions office for information on how to get the application process started. Established in 1906 when brothers Homer and Charles Pace founded the accountancy and business schools of Pace & Pace, today's Pace University, is a four-year, public institution of higher learning with a main campus located in New York, New York. Operating under the school motto of "Opportunities," the university began with a group of 13 men and women students in a rented room of the New York Tribune Building. Receiving its regional accreditation through the Middle States Commission on Higher Education, the university delivers degrees at the associate, undergraduate, graduate, and doctoral levels to the student body of 13,245 currently enrolled there. Home of the Setters, the athletic department at Pace supports 19 men's and women's varsity sports teams which compete at the NCAA Division II level as members of the Northeast-10 Conference. The school's official colors are blue and gold. St. Joseph's College New York delivers one of New York's best online Master's of Business Administration degrees with a concentration in Health Care Management or delivered as an Executive MBA. These high-powered 36-credit hour programs is a must for the business student seeking a quality distance education. Photo creditOne of the state's best online Master's of Business Administration degrees with a concentration in Health Care Management or delivered as an Executive MBA is offered at St. Joseph's College New York. This 36-credit hour program is classified as average in affordability with a total tuition price between $20,000 and $29,999. Core courses included in the EMBA are Leadership and Managerial Development, Legal Issues in Management, Organizational Theory and Design, Marketing Concepts and Strategies, Management Information Systems, Financial Accounting and Analysis, Strategic Human Resources Management, and Statistical Applications in Research and Management. U.S. News & World Report has recently recognized the business school as offering the 205th best online MBA in the nation. The Executive MBA, "like our other Graduate Management Studies programs, helps develop managerial skills across every facet of business and builds the analytical skills that solve everyday business problems." Candidates for this degree are encouraged to complete an online graduate application and submit a current resume, GMAT score, and evidence of a completed undergraduate degree with at least a 3.0GPA to the admissions office in order to begin the acceptance process. Home of the Bears (Brooklyn) and Golden Eagles (Long Island), St. Joseph's College New York features campuses in both the Bronx and Long Island, New York. The athletic department at St. Joseph's in Brooklyn supports men's and women's varsity sports teams which compete at the USCAA level as members of the Hudson Valley Athletic Conference for men and women, while the Long Island Golden Eagles compete at the NCAA Division III level as members of the Skyline Conference. SJC is a four-year, private not-for-profit institution of higher learning delivering degrees at the undergraduate and graduate levels to the 5,119 students currently enrolled there. The college got its start in 1916 when it opened its doors as St. Joseph's College for Women. The school's official motto is Esse non videri (To be, not to seem). An online Master's of Business Administration is offered by the School of Business and Accounting at Monroe College. This 46-credit hour program stands out from the pack with an excellent accreditation through the ACBSP and recognition from U.S. News & World Report as one of the best in the nation. Photo creditMonroe College offers one of New York's best online Master's of Business Administration programs with concentrations in Community Development, Entrepreneurship, Finance, Marketing, Healthcare Management, and Information Technology at the School of Business and Accounting. This 46-credit hour program is classified as above average in affordability with a total tuition price between $30,000 and $49,999. U.S. News & World Report has recently recognized the business school as offering the 125th best online MBA in the nation. The School of Business and Accounting receives its excellent business accreditation through the Accreditation Council for Business Schools and Programs. The ACBSP is one of the most prestigious accrediting bodies in higher education. This excellent 100% online MBA has been designed "to help business professionals climb to new heights in their careers. As an online student, you'll gain the essential knowledge and tools, along with the flexibility you need to continue to build your career." Core courses within this program include Graduate Research and Critical Analysis, Ethics and Leadership: An interdisciplinary Perspective, Managing in a Global Environment, Research and Statistics for Managerial Decision Making, Organizational Behavior and Leadership in the 21st Century, Managerial Economics, Strategic Marketing, Managerial Finance, and Strategic Management. Established in 1933, Monroe College is a four-year, private for-profit institution of higher learning with a main campus located in Bronx, New York. The school was originally called the Monroe School of Business when it was founded by Mildred King to offer young women a business education. Receiving its regional accreditation through the Middle States Commission on Higher Education, the university delivers degrees at the associate, undergraduate, and graduate levels to the student body of 6,823 currently enrolled there. Home of the Mustangs, the athletic department at Monroe supports men's and women's varsity sports teams which compete at the National Junior College Athletic Association as members of the NJCAA Region XV. The school's official colors are blue and gold. The School of Business at SUNY New Paltz features one of New York's best online Master's of Business Administration degrees. This nationally-recognized, high-quality program is backed by the business school's stellar business accreditation through the AACSB. Photo creditAn online Master's of Business Administration is delivered by the School of Business at SUNY New Paltz. This 36-credit hour program is classified as average with a total tuition price of between $15,000 and $19,999. Qualified students with the proper academic experience may waive up to nine hours of foundational courses and complete this degree with only 36-credit hours taken. The School of Business receives its excellent business accreditation through the Association to Advance Collegiate Schools of Business. This degree can be completed in as few as two years while taking courses on a part-time basis. Students can take all classes completely online, in the classroom, or as a combination of the two for a hybrid educational experience. Many courses in this program are offered on the campus during evening and weekend sessions. The business school provides both on-campus and online students access to MBA professors who can help as mentors. Originally founded as the New Paltz Classical School in 1828, today's SUNY New Paltz operates as one of the four SUNY school in the New York area. Receiving its regional accreditation through the Middle States Commission on Higher Education, the university exists today as a four-year, public institution of higher learning with a main campus in New Paltz, New York. Delivering degrees at the undergraduate and graduate levels, SUNY New Paltz oversees a student body of 7,628. Home of the Hawks, the official school colors are blue and orange. The athletic department at the university consists of men's and women's varsity sports teams which compete at the NCAA Division III level as members of the State University of New York Athletic Conference. Mercy College's School of Business features an online Master's of Business Administration. This 33-credit hour program is one the discerning distance learner should take note of as it features a solid curriculum and a national ranking through U.S. News & World Report. Photo creditThe School of Business at Mercy College features one of New York's best online Master's of Business Administration programs with concentrations in Finance, Human Resources Management, International Business, Management, Marketing, and Organizational Leadership. Qualified students with the proper academic experience may waive up to credits of Business Core courses and complete this degree with only 33-credit hours taken. This 100% online program is classified as average in affordability with a total tuition price between $20,000 and $29,999. Graduates of this MBA will be capable in "the application of essential business skills in decision-making, identifying problems, evaluation of options and implementation of recommended solutions, the utilization of foundational quantitative analysis and research skills to develop managerial strategies, diverse communication strategies within the global business environment, and the importance of today's manager as a leader and facilitator." Courses within this program include Economic Environment of Business, International Business, Management & Life-Work Planning, Communication Processes, Quantitative Method of Business Research, Managerial Economics, and Business, Government, and Society. U.S. News & World Report has recently recognized the business school as offering the 205th best online MBA in the nation. Mercy College is a four-year, private not-for-profit institution of higher learning with a main campus located in Dobbs Ferry, New York. The university delivers degrees at the associate, undergraduate, graduate, and doctoral levels to the 10,099 students currently enrolled there. Mercy was originally established in 1950 by the Sisters of Mercy and would become a four-year college eleven years later. Over the years, the school grew and began offering online courses in the 1990's. Mercy College receives its regional accreditation through the Middle States Commission on Higher Education. Home of the Mavericks who compete at the NCAA Division II level as members of the East Coast Conference, the school's official colors are blue and white. An online MBA is delivered by Niagara University's College of Business Administration. This high-quality program has been designed to equip effective business leaders. Photo creditNiagara University's College of Business Administration features one of New York's best online Master's of Business Administration degrees with a concentration in Strategic Management. This 33-credit hour degree is classified as average in affordability with a total tuition price between $20,000 and $29,999. "By emphasizing business performance based on analytics and creative problem solving, the program is designed to create value for corporate employees as well as small business and entrepreneurial ventures. Since the global economy is increasingly a knowledge-based economy, this online strategic management concentration will also provide students with an edge in understanding and competing in the digital economy." Core and concentration courses within this program include Financial and Management Accounting, Analysis of Quantitative Data, Economics for Managers, Law & Business Ethics, People in Organizations, Creative Problem Solving, Strategic Marketing, Organizational Development, and Strategic Supply Chain Management. Qualifying students with the proper academic background may waive up to 18 credit hours of prerequisite courses. Established in 1856, Niagara University is a four-year, private, not-for-profit institution of higher learning with a main campus located in Niagara University, New York. Operating under the school motto of Ut Omnes Te Cognoscant "That All May Know You," the university was originally founded as Our Lady of Angels Seminary by the Congregation of the Mission. Receiving its regional accreditation through the Middle States Commission on Higher Education, the university delivers degrees at the associate, undergraduate, graduate, and doctoral and levels to the student body of 4,017 currently enrolled there. Home of the Purple Eagles and featuring the mascot Monte, the athletic department at the school supports men's and women's varsity sports teams which compete at the NCAA Division I level as members of the Metro Atlantic Athletic Conference. The school's official colors are purple and white. Hofstra University delivers one of New York's best online Master's of Business Administration degrees at the Frank G. Zarb School of Business. This incredible 45-credit hour program is a must for the business student seeking a high-quality distance education. Photo creditThe Frank G. Zarb School of Business at Hofstra University delivers an online Master's of Business Administration with specializations in Strategic Business Management and Strategic Healthcare Management. This 45-credit hour program is classified as expensive with a total tuition price between $50,000 and $99,999. Features for this program include "a clear focus, relevant to all areas of businesses, small class sizes in a cohort-based format with a totally customized âdigital classroom' environment that also allows for seamless interaction between faculty members and students, and a global and industry focus with residency requirements which include interaction with New York City industry leaders and global corporations." Divided between Core Competencies, Advanced Core, and Major Concentration credits, the Advanced Core courses include Accounting and Financial Reporting, Managerial Finance, Information Systems for Managers, Global Decision Making, Operations Management, Contemporary Organizations: Theory, Behavior and Leadership Skills, Marketing Analysis and Management, and Advanced Quantitative Analysis for Managers. The Frank G. Zarb School of Business receives its top-notch business accreditation through the Association to Advance Collegiate Schools of Business. The business school has retained this prestigious accreditation for over four decades. Recognitions for this program include U.S. News & World Report recently recognizing the business school as offering the 36th best online MBA in the nation and the Princeton Review awarding it with the 17th top spot in the country. Home of the Pride who wear the school colors of blue, white, and gold, the athletic department at Hofstra University supports men's and women's varsity sports teams which compete at the NCAA Division I level as members of the Colonial Athletic Association. Hofstra is a four-year, private not-for-profit institution of higher learning with a main campus located in Hempstead, New York. The university delivers degrees at the undergraduate, graduate, and doctoral levels to the 11,145 students currently enrolled there. The school was founded in 1935 as an extension of New York University offering day and evening classes to co-ed commuter students. Hofstra University receives its regional accreditation through the Middle States Commission on Higher Education and features "I stand steadfast" as its official school motto. An online Master's of Business Administration is offered by the School for Graduate Studies at SUNY Empire State College. This 36-credit hour degree shines with the business school's excellent accreditation through the International Assembly for Collegiate Business Education. Photo creditSUNY Empire State College offers one of New York's best online Master's of Business Administration degrees with concentrations in Management and International Business at the School for Graduate Studies. This 36-credit hour program is classified as average in affordability with a total tuition price between $20,000 and $29,999. The School for Graduate Studies receives its excellent business accreditation through the International Assembly for Collegiate Business Education. This incredible, 100% online MBA has been designed for "aspiring, early and mid-career managers and professionals interested in enhancing their functional and professional skills and knowledge for career growth and advancement. Throughout the program, students will develop and improve their critical and strategic thinking, problem-solving, ethical decision making, leadership, and managerial communication skills, develop cross-cultural competence and sensitivity, and apply and practice management strategies in various contexts." Students seeking an accelerated experience can take courses as full-time students and complete all program requirements in just 20 months by enrolling in nine credits per term. Students working at a part-time pace can graduate in 27 months. Up to nine hours of foundational coursework may be waived by students with the proper academic background. Established in 1971, SUNY Empire State College is a four-year, public institution of higher learning with a main campus located in Saratoga Springs, New York. The college was a brain child of State University of New York Chancellor, Ernest L. Boyer. Boyer's hope was to see a New York-based college which would focus on adult-student centered education by making it possible for working adults to seek higher education. Receiving its regional accreditation through the Middle States Commission on Higher Education, the school delivers degrees at the associate, undergraduate, and graduate levels to the student body of 11,315 currently enrolled. Empire State maintains over 30 centers for learning across the state of New York. The School of Business and Technology at Excelsior College features one of New York's best online Master's of Business Administrations. This nationally-recognized, high quality program balances solid business theory with a relevant application model. Photo creditOne of New York's best online Master's of Business Administration programs is delivered by the School of Business and Technology at Excelsior College. This 36-credit hour program is classified as average in affordability with a total tuition price between $20,000 and $29,999. Students with the proper academic credentials may waive up to nine credit hours while students with transferable credit may transfer up to 24 credits into this program. Program outcomes for this degree include a graduate's being able to "design, implement, and evaluate the efficacy of solutions for complex business problems, engage in life-long learning for professional, career, and personal development, and lead and work effectively and efficiently in diverse team settings and maintain a high level of performance in a professional business environment." Divided between 27 core credits and nine concentration credits, the core courses within this program include Accounting for Managers, Global Business Environment, Managerial Finance, Marketing, Operations Management, Project Management Principles and Applications, Leadership, Information Technology, and Strategy and Policy. The School of Business and Technology receives its excellent business accreditation through the International Assembly for Collegiate Business Education. Excelsior College was established in 1971 as the New York State Board of Regents' external degree program known as the Regents External Degree Program (REX). The school would receive its charter to operate as an autonomous entity in 1998 and three years later would be renamed Excelsior College. The word "excelsior" is Latin for "ever upward." Receiving its regional accreditation through the Middle States Commission on Higher Education, the college exists today as a four-year, private not-for-profit institution of higher learning with a main campus in Albany, New York. Delivering degrees at the associate, undergraduate, and graduate levels, Excelsior oversees a student body of 41,658. The school's official colors are purple and gold. St. Thomas Aquinas College's School of Business features an online Master's of Business Administration. This 33-credit hour program is one the discerning distance learner will want to consider as it features a solid curriculum and is bolstered by accreditation through the IACBE. Photo creditThe School of Business at St. Thomas Aquinas College features one of New York's best online Master's of Business Administration degrees with a concentration in Finance, Marketing, Management, Sport Administration, or delivered as a general MBA. This 33-credit hour program is classified as above average in affordability with a total tuition price between $30,000 and $49,999. The School of Business receives its excellent business accreditation through the International Assembly for Collegiate Business Education. Qualifying students with the proper academic background may waive up to 24 credit hours of coursework saving time and money on this incredible degree. The core requirements for this degree include three Business Communication credits, 15 Finance, Management, or Marketing credits, and six Capstone course credits. Admission requirements include an undergraduate degree from an accredited college or university, a minimum GPA of 2.8, three letters of recommendation, and a completed MBA Application. Courses within this program include Financial Accounting, Legal Environment of Business, Human Resource Management, Direct Marketing, Business Policy, Research and Decision Making, Money and the Economy, Contemporary Accounting and Theory, and Corporate Strategy. Home of the Spartans who wear the school colors of maroon and gold, the athletic department at St. Thomas Aquinas College supports men's and women's varsity sports teams which compete at the NCAA Division II level as members of the East Coast Conference. The college is a four-year, private not-for-profit institution of higher learning with a main campus located in Sparkill, New York. St. Thomas delivers degrees at the associate, undergraduate, and graduate levels to the 1,852 students currently enrolled there. St. Thomas Aquinas College was established in 1952 by the Dominican Sisters of Sparkill. The school's namesake, Thomas Aquinas, was a Catholic priest and theologian who established Thomism. St. Thomas receives its regional accreditation through the Middle States Commission on Higher Education. An online MBA is delivered by St. John's University's Peter J. Tobin College of Business. This excellent program offers the distance learner a high-quality education in business without sacrificing flexibility and convenience. Photo creditSt. John's University's Peter J. Tobin College of Business features one of New York's best online Master's of Business Administration degrees with concentrations in Interdisciplinary Business, Risk Management and Insurance, and Taxation. Program outcomes for this degree include a graduate's being competent to "gain a global business perspective, apply business knowledge and skills effectively, make strategic, integrative decisions, and gain a big-picture, cross-functional understanding of global financial and managerial reporting, business analytics, industrial economics, marketing management, and managing workers in a global environment." This 36-credit hour degree is classified as above average in affordability with a total tuition price between $30,000 and $49,999. Students can complete all requirements for this degree in just 18 months while taking courses as a full-time student or take three years to graduate as a part-time student. Divided between 27 credits of core courses and nine credits of concentration courses, the core courses within this program include Global Finance & Managerial Reporting, Risk Management, Law, Ethics, and the Principled Path in Business, Financial Management, and Global Financial and Managerial Reporting. Qualifying candidates may be eligible for a GMAT waiver during the acceptance process. The Peter J. Tobin College of Business receives its stellar business accreditation through the Association to Advance Collegiate Schools of Business. Established in 1870, St. John's University is a four-year, private not-for-profit institution of higher learning with a main campus located in Queens, New York. Operating under the school motto of Educatio Christiana Animae Perfectio "Christian education perfects the soul," the university was originally founded by the Vincentian Fathers of the Roman Catholic Church in an effort to serve the underprivileged youth of New York. The university was first known as the College of St. John the Baptist in Brooklyn. Receiving its regional accreditation through the Middle States Commission on Higher Education, the university delivers degrees at the associate, undergraduate, graduate, and doctoral levels to the student body of 21,076 currently enrolled there. Estimated Tuition Cost (25%): Each online MBA program was assessed to find the estimated total base tuition. All data was gathered from the most recent tuition information given on each program or school website. The base tuition was calculated for the entirety of the program, but does not included fees, books, or room and board; with the exception of MBA programs that use all-inclusive figures. For colleges that offer a lower in-state tuition, the in-state pricing is used. Twenty-five percent of the final ranking score is calculated from this figure. Accreditation (25%): Accreditation plays an important role in education. It shows prospective students which school has gone to extensive measures to attain high national and global standards in its research and delivered education. Each online MBA program in this list is evaluated on whether it holds a regional accreditation from one of the six institutions that are recognized by the U.S. Department of Education. Additionally, business accreditations affect an MBA's brand and prestige, which can thus affect a graduate's competitive advantage in the job market. Each school is evaluated on if the online MBA program is accredited from one of the top business accrediting institutions: ACBSP, IACBE, or AACSB. AACSB is regarded as the gold-star standard of business accreditation in the world, and thus schools that hold this accreditation are given the highest marks. Twenty-five percent of the final ranking score is calculated from this figure. Average Base Salary (25%): The salary data is highlighted in this top online MBA ranking because it allows prospective students to explore the affect an online MBA degree can have on a graduate's salary. The average base salary is collected from the 2018 Best Business School Ranking by US News and World Report. Programs without a recorded average base salary from US News and World Report were calculated at zero because of no available third-party data. Twenty-five percent of the final ranking score is calculated from this figure. All of the criteria was weighted equally, averaged, and then calculated on a 100-point scale. This score is the OMBAT Ranking Score, which provides the ranking order for this list. By evaluating the tuition cost, accreditation, average base salary, and prestige, this ranking helps prospective students find the highest quality online MBA programs in New York.